I took J to the yarn store a few months ago to pick out a new project. She gravitated immediately to the bubble gum pink Cascade Superwash 220, no surprise there, and after perusing Ravelry, I found a free cabled hat pattern to make out of it. She is in a phase where she doesn’t want to wear anything that’s not pink. That thong th thong thong thong. Or earflap. I used to be staunchly anti-pink. I’ve learned my avoidance of the color is just as silly as wanting to wear only that color. It’s a color, not an anti-feminist doctrine. “Your favorite color is pink,” J said to me the other day. I opened my mouth. Shut it. Logic. “You’re right, kid. You have me there.” We discussed that one did not always have to wear one’s favorite color. Or release books in one’s favorite color, for that matter. Sometimes it’s good to change it up. For instance, mommy’s first book was blue. So anyway, since J also likes to strip off her warm clothes and we are deep in the throes of winter, I decided to go pink, pink, pink to try to get her to wear coats, hats, and mittens. It’s working. Mostly. 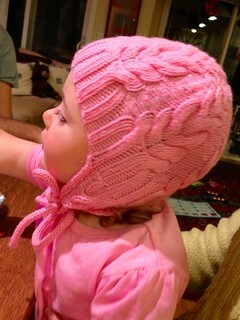 I also hoped that if she picked out the yarn she might deign to wear the hat (unlike the sweaters I knit!). She’s already worn it a few times, so I count that a success! I had some troubles not keeping close track of where I was in the pattern, so I had to rip half of it out. Twice. As my grandmother used to say, “As ye knit, so shall ye rip.” It was painful, but this happens to me a lot. 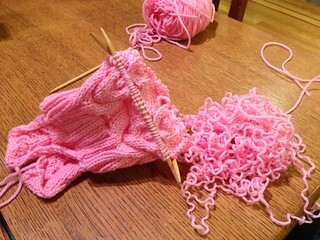 I lose track of what row I’m knitting, and before I know it, I have to unknit hours of work. Knitting is very meditative until that point. 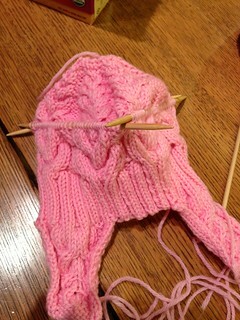 The pattern itself was fairly easy, if you are familiar with cables and double pointed needles. The only thing left to do is make pompoms for the top and tassels. Voila! A hat to keep off the bitter frost in splendid fashion.